Specialising in providing a roster of ladies from all across Asia, the Gold Coast’s LuvAsian Brothel in Molendinar is a specialist bordello with a good reputation. Management offer a selection of over 200 ladies each year from across Asia, including Thailand, Korea, China and Japan. That’s a LOT of ladies passing through its doors. Luv Asian is just a ten minute drive away from Surfers Paradise and is a popular brothel for locals and tourists alike. It has a good reputation for willing ladies that are attractive, well-put together and who specialise in a variety of different services. The house charges a fee for the use of the rooms but the rates are paid directly to each prostitute. This means you will need to negotiate for anything on top of a standard service. The décor is a bit dated and the facilities are not as five-star as their website would like to make out but the place is clean, modern and very adequate for the prices charged. It is situated in an industrial estate making it a private location away from the neighbouring tourist hot-spots and busy crowds. You will find the management team quite strict with rules on having your phone about you so it is advisable to switch this off just to be on the safe side. Having said this, they are reasonably friendly and the girls very easy on the eye. The roster changes weekly so, if you have received a recommendation or have your eye on someone special, you can request an appointment. Reservations are usually taken from regular clients only so be prepared to arrive and your choice may already be engaged. Overall LuvAsian is a well-priced brothel with a good selection of Asian ladies offering very good services from standard to stand-out. If you are specifically looking for an exotic Asian brothel experience, then this is definitely the brothel to go to on the Gold Coast. There are private waiting rooms in addition to the main waiting lounge where you can select from the roster of ladies available however, entrance and exits are all via the main foyer so you can expect to come face to face with other punters. 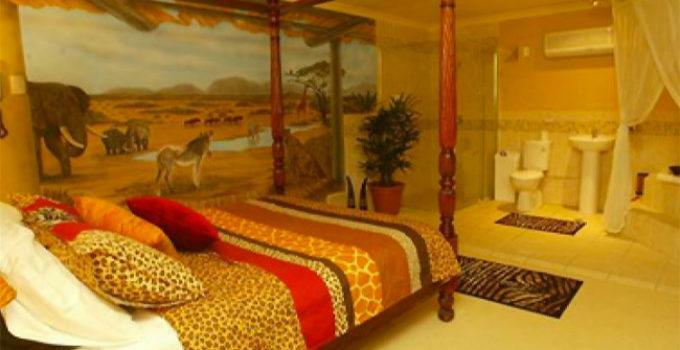 The brothel has a range of themed rooms available for use with their clients including a French Boudoir, African Safari room and Hawaiian inspired bedroom. Though not exactly in keeping with their central theme of supplying Asian ladies, the rooms are well decorated and include modern facilities (the toilets in the room are not that private and are merely screened for some degree of privacy). However, the Geisha themed room with its spa and ceiling mirror is more in keeping and has a touch more of luxurious quality to it. 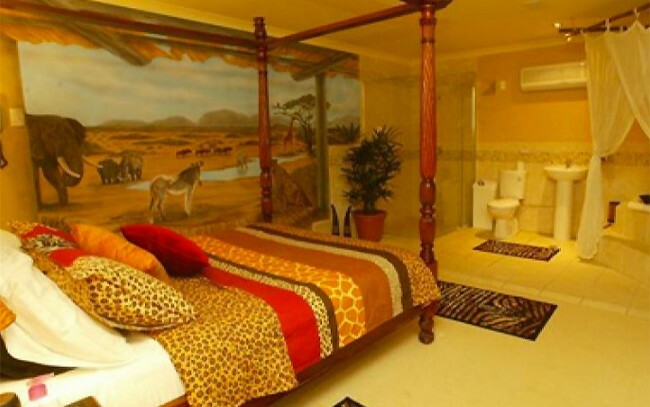 The safari themed room at Luv Asian, image from their gallery. Luv Asian is open from Sunday to Thursday between 10am and 3am as well as Fridays and Saturdays from 10am to 5am. The website does state in places that it is open 24 hours per day and, in keeping with the state laws, they do not offer outgoing services for escorts. Online discounts are available so always mention that you found the prices online when you visit the brothel. Prices are charged according to the duration of your visit and are broken down into a room fee and a service fee. Charges vary depending upon the time of day. ***Please note the rates below were correct as of January 2018 but you should check their website for the most up-to-date rates. They can offer a 20 minute full service for a discounted fee of $110 but this is only available during the daytime shifts. The room fees are payable directly to the brothel whilst the service fees are paid to your hostess. The venue accepts payment by China UnionPay as well as Visa, Mastercard, EFTPOS and cash (foreign and AUD). All payments made other than cash are subject to a surcharge. The brothel is located at 1/29 Expansion St, Molendinar, Gold Goast, QLD. The area is predominantly commercial and the parking is set back from the road making entrance and exits quite private and discreet. Looking for full service at one of Gold Coast’s premier asian brothels? Here are the details you will need to make an advance booking. Have you been to LuvAsian? Are there any other specialist Asian brothels around Gold Coast that you’d recommend?